My name is Mylene Sait-Rosenberg. I am 17 years old, and since February 2017, I have organised four blood donation drives. The idea of a blood donation drive came to my mum and I when we were brainstorming for ways to give back to society. When I was very young, my grandmother needed regular blood transfusions to treat a blood disorder. This was a very difficult time for my family, however, as a young girl I was not fully aware of the significance of a blood transfusion. In fact, I never really understood it until I visited the Thalassaemia Ward in the Latifa Hospital and was saddened to see so many children, ranging from two to eighteen years old, awaiting their regular blood transfusions, and it was heartbreaking to see the look of despair and helplessness on their parents’ faces. Most of the children require blood transfusions every fortnight for the rest of their lives. It was a major eye-opener to see people my age live such different lives to me, and I fully realised how important my initiative is in helping people across Dubai. My campaign, “Somebody Needs You” (in association with the Dubai Blood Donation Center) has fortunately been very successful, with over 200 donors taking part, saving approximately 600 lives. 15 minutes saves three lives. A small effort is all it takes to make a big difference in our community. Dubai has been my home for 17 years and has given me a wonderful life, so to give back to my city is an amazing feeling. I hope one day I will be in a position to do more. The Latifa Hospital kindly provided us with a specially equipped mobile unit (in which the blood collection takes place) and a medical team of around six nurses. My fifth blood drive took place on Friday March 29, 2019, and was a great success, with around 50 donors and many supporters. We had an array of delicious homemade sandwiches and snacks, and each donor went home with a memento: a lucky bamboo plant and a turquoise good-luck charm, with a handwritten ‘Thank You’ note from me. I more than appreciate the kindness shown to me by The Irish Village, for their ever-willing staff who have not only helped to set up but who have turned out to be loyal donors, and for the use of the venue, which is always so lively and vibrant. I am also filled with gratitude towards the Blood Donation Centre, who for each drive send a mobile unit and a very friendly medical team, who are always smiling and reassuring the donors. To have an atmosphere like this makes it such a happy day for everyone. This was my last drive before I leave for university, and to have such a great turnout was so heart-warming and really made me feel like I had achieved my goal of making a difference. I am beyond thankful to all the donors and supporters; together, we saved many lives. ■ Donors need a valid Emirates ID to donate, and should be in good general health. ■ They must be between ages 18-65 in order to donate. ■ Donating one blood unit (approximately 450 ml) takes roughly fifteen minutes and can save three to four lives. ■ Blood donations are very safe; all materials are new, sterile, disposable and used only once. ■ Qualified and certified teams will assist you and ensure your safety during the donation. ■ It improves the health of the donor, as it helps to balance the axis of the body’s iron as well as reduce the risk of heart attacks and strokes. It also activates the bone marrow to produce more blood cells. 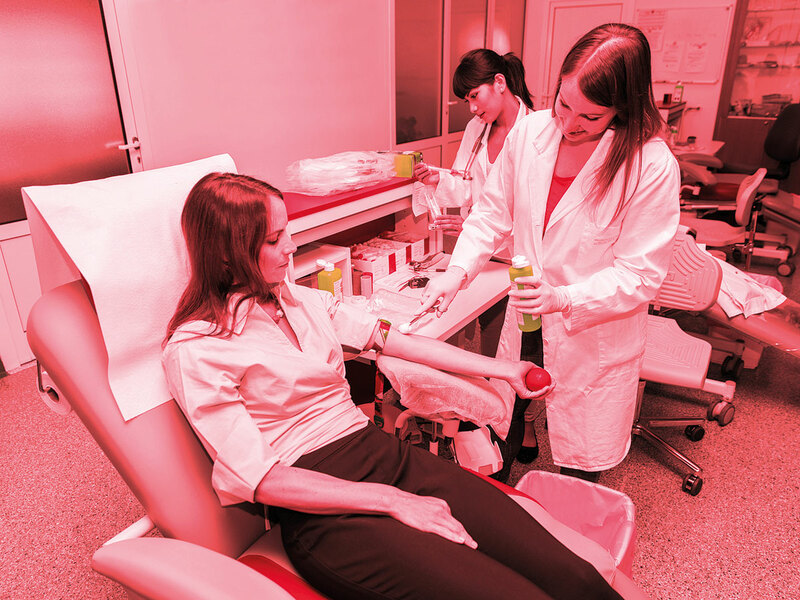 1 in 4 people who reach a hospital in the UAE need a blood transfusion. Thalassaemia is an inherited blood disorder, characterised by abnormal haemoglobin production. This genetic condition is very common in the Middle Eastern region. The disorder depends largely on the national blood stock, potentially increasing pressure on the use of blood for other treatments, and may result in a shortage of blood in the UAE.